In Walt Disney’s Legend of Sleepy Hollow, Ichabod Crane was all arms and legs. Andy Boswell was a real-life version of that unique character, but unlike Ichabod, Boswell, whose 6’1” 165 pound frame was unusual for the times, was a talented athlete. Sadly in later life chronic arthritis would rob him of the use of his legs. Yet the disease could never destroy his competitive spirit. Born September 26, 1873 in New Gretna, New Jersey, Andrew Cottrell Boswell was the first of two sons born to John and Alletria Boswell. John H. Boswell had made a name in Ireland as a cricket player 1before coming to America. He served in the Union army in the Civil War before serving numerous congregations in New Jersey as a Methodist minister. In New Jersey he met and wed a widow, Alletria Strickland, and raised a blended family with her two daughters. John was at the Pittman M. E. Church in New Brunswick, New Jersey in the 1890’s when Andrew appeared on the sports scene. Andrew entered the University of Pennsylvania in 1892. He pitched for them the next two years before leaving for law school at New York University. 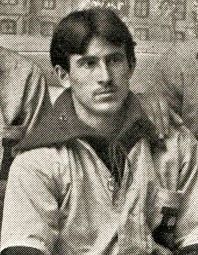 Boswell learned his baseball on the sandlots and was one of five pitchers who tried out for the Penn team in 1893. Coach Arthur Irwin had over a 1000 games playing experience in the majors and had already managed three seasons in professional ball. The gangly 6’1” 165 pound Boswell caught Irwin’s eye with his speed and his uniquely distracting pitching motion. “The long limbed young gentleman makes … use of his arms and legs…In delivering the ball he comes as near the “split” act as is ever seen on stage. The right leg lies on the ground from the knee to the end of the foot and the long left is projected forward at an angle of ninety degrees… the great right arm flails around like a whip lash, and the batsman has nothing to do but guess and trust to luck.”2 In Boswell’s two seasons at Penn the team compiled records of 15-14-1 and 18-8. Future major league catcher Dan Coogan and longtime outfielder Roy Thomas were teammates. He had moments of brilliance, but by no means was he invincible. He pitched before a crowd of 8000 against Yale on May 12, 1894 and triumphed 28-18. He contributed three singles and a double, but also surrendered 21 hits. That season he lost to Yale in a rematch and to Princeton. In March, 1895, Boswell was player/coach of the New York University team, when President Andrew Freedman of the New York Giants paid a visit. Freedman offered a “conditional” contract and Boswell accepted. In mid-April he signed for $1800 and joined Amos Rusie, Jouett Meekin, Dad Clarke, and Lester German on the Giants pitching staff.5His initial manager was shortstop George Davis, but Jack Doyle took over after 33 games. Boswell got his first action in Louisville on May 10 when he came in to relieve Meekin down 8-0. “In six innings four Kentuckians reached first base, two on hits, one on balls, and one by being hit by the ball.”6the performance earned Boswell his first start on May 17 versus Pittsburgh. Boswell walked five, but the Pirate’s hurlers issued 11 free passes in an 18-8 New York victory. He next took the box on May 24 in Cleveland. “Mr. Boswell got another trial for two innings to-day. He got away with the “split” act very gracefully, and the ball had a great jump on it, but the jump went the wrong way. Once it jumped over the left field fence” 7for a home run by Harry Blake. Boswell was yanked trailing 8-2 in the eventual 14-11 loss. A week later, Jack Doyle took over for Davis as manager. On June 7 he sent Boswell against Louisville and witnessed Boswell’s finest work; a 9-3 win with only 2 walks and 5 strikeouts. On June 15 the Giants hosted Cincinnati and Boswell gave an awful performance. In the 16-2 loss he committed three errors (the team had 14), threw two wild pitches and walked a dozen. Within the week he was released, returned home and was pitching for Cape May. In late August, Manager Gus Schmelz of the Washington Senators offered a contract. The Washington squad was barely holding on in the standings and finished in tenth place ahead of St. Louis and Louisville. Boswell got a start on September 3 versus Louisville and lost 5-2. Two days later he was sent against Cincinnati and lasted six innings in a 12-6 loss called by darkness. On September 12 first baseman Ed Cartwright got into an argument with the umpire and was ejected. Boswell played the remainder of the game at first base. He would make three relief appearances before getting a starting assignment in the first game of a doubleheader on September 30. On a cold, blustery day that marked the end of the season, Boswell beat Boston 15-7. With the two teams he pitched in 64 innings in 11games, posting a 3-4 record to go with his 5.91 ERA. Despite signing with the Senators for 1896 he would not see action in the majors again. Boswell went to spring training in 1896 with Washington, but it became obvious that he was the least skilled of the pitchers. In mid-April Manager Schmelz arranged for him to join Tom Loftus with Columbus in the Western League. During the season the Buckeyes would employ nearly 30 players, many who had already been in the majors. Not surprisingly the team never jelled and their performance was sloppy because the roster was in a state of flux. Used sparingly at first, Boswell got a start against Indianapolis on May 4, winning 7-4. His next start was a 9-2 win over the same club. Fortunes changed and he dropped three games including a 22-10 loss in St. Paul. That defeat must have put Boswell in a foul mood because he took exception his next start with a young Minneapolis fan who called him “legs”. Allegedly Boswell punched the boy, was arrested, and fined $2.8 Boswell became the ace of an ever-changing staff and according to the Sporting Life had a 17-19 record for the 52-90 Buckeyes. They finished 40 games back of Minneapolis in the standings in seventh place. Boswell decided that law should occupy his full attention and he returned to school in the fall. By 1900 he had passed the bar and joined a practice in Trenton, New Jersey. 10 Trenton Evening Times, February 7, 1936:22.